No, your eyes do not deceive you. 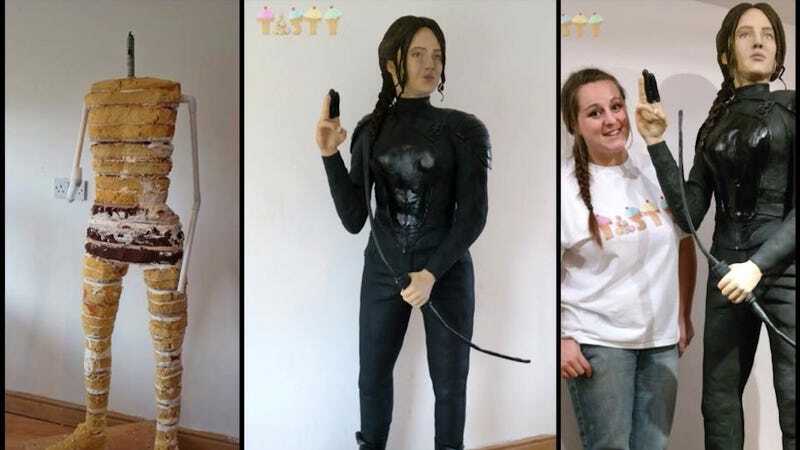 You are, in fact, looking at a life-sized Jennifer Lawrence in costume as Katniss Everdeen, made of sponge cake. The Telegraph says it's the work of one Lara Clarke, who won the Cake International contest in Birmingham, England with this masterpiece. (As if that wasn't impressive enough, she made a Tyrion Lannister cake, too.) All it took was £600, 150 eggs, 22 lb. of flour and butter, and ten weeks of work. But before you go scooping off a handful of cake, please note that it's not really fit for human consumption: "Some of the cake inside is around three months old so is definitely past its best," she clarified. Clarke learned baking from YouTube tutorials, according to the Telegraph, and she won the competition last year, as well, with a crisped rice construction made to resemble Jack Sparrow. She's since started her own business, Tasty Cakes. Something to ponder the next time you get a sugar craving and, having rifled through your entire kitchen, resort to the mysterious pudding snack found at the very back of your refrigerator.